I’ve wrote about my undying love for gyozas before, nothing has changed. I still eat copious amounts of the blighters and I still have a warm fuzzy feeling when I have a freezer full. The only thing that has changed is my house is now half vegetarian. Since I don’t want to leave my poor boyfriend out of my frenzied gyoza eating sessions I decided to whip up some sans-meat. So here we have it, homemade asparagus and tofu gyoza. 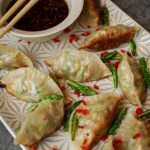 In fact, these homemade asparagus and tofu gyozas aren’t just vegetarian, they’re also vegan friendly. The best thing about these little dumplings of joy is they freeze perfectly. Simply freeze them in on layer before transferring them into freezer bags, you never know when an unexpected guest may drop by. 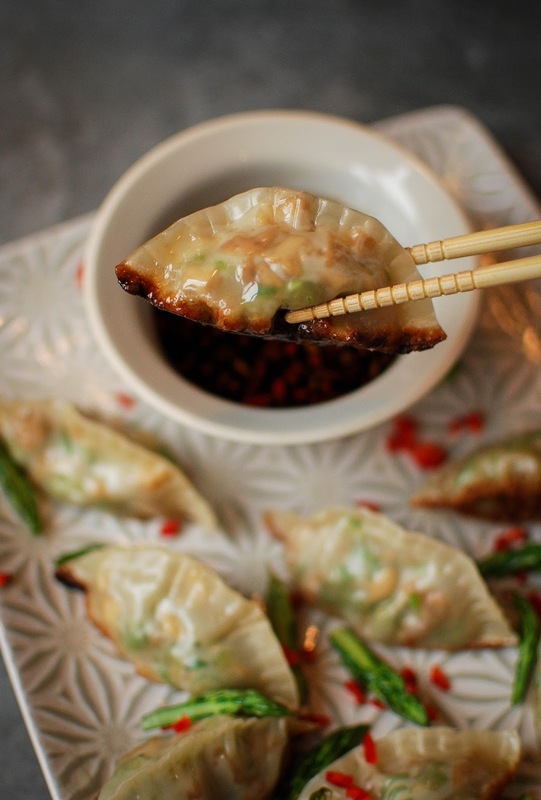 Plus, the kudos you’ll get for steaming up a big batch of dumplings is amazing, nobody will believe you made these seemingly complex little parcels. I get my gyoza wrappers from the frozen section of my local Asian supermarket, along with any of the harder to find veggies and sauces. They really are a total treasure trove of interesting ingredients, I could get lost for hours meandering through the colourful isles. If you’re in the Newcastle area, I recommend HiYoU, it’s my go to. Don’t forget your dumpling press if, like me, you can’t hack the fiddly folding process. I’m just too damn impatient, I’m sure I’ll learn one day. I used Cauldron Marinated Tofu in this recipe as there’s no need to press it. Saves so much time and mess. 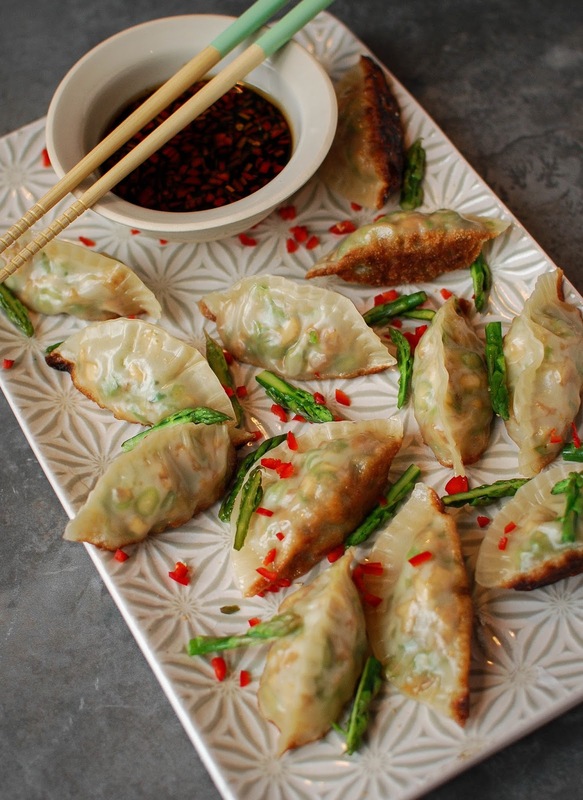 These dumplings are adapted from The Part Time Vegetarian cookbook. I cannot recommend this book enough for multi-diet households. Filled with vegetarian and vegan recipes with little notes on how to change it if you’re partial to a bit of meat. I have to say, it’s one of my favourite cookbooks of last year. 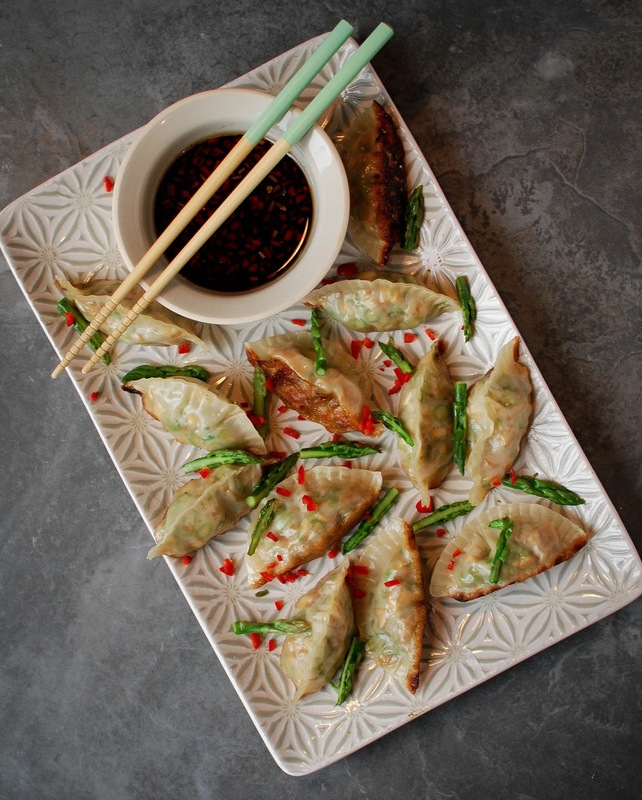 These homemade asparagus and tofu gyoza aren’t just vegetarian, they’re also vegan friendly. The best thing about these little dumplings of joy is they freeze perfectly so you can always have a stash on hand. Mix together all of the ingredients for the dipping sauce and set aside. Mix all of the filling ingredients together apart from the asparagus tips. Slice the tips in half lengthways and set aside. 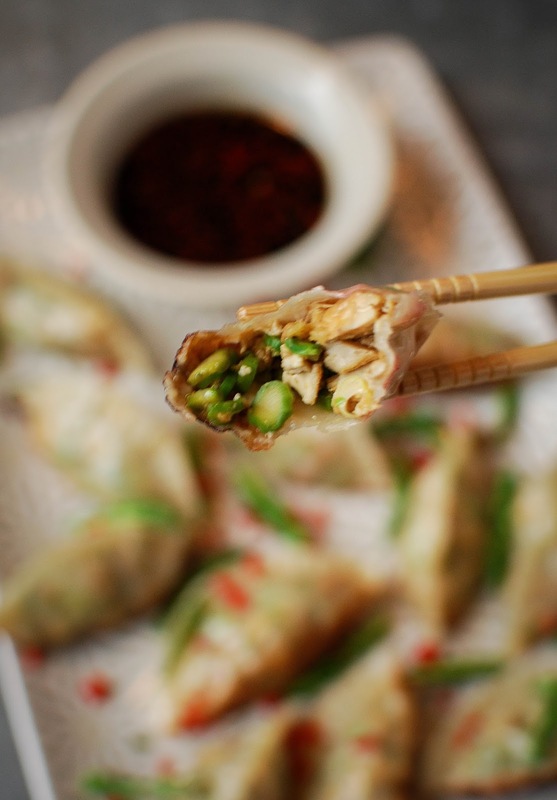 Place 1tbsp of the filling into a gyoza wrapper, moisten the edge and fold in half, pleating the edges. Or, if you have a dumpling press, place the wrapped into the press, pop your filling in the middle and fold. Repeat until you have used up all of your filling. Pour your vegetable oil into a large frying pan with a lid and place over a medium heat. Place 10 gyoza, flat side down, in the pan and fry for 2 minutes until the bottoms are crisp and brown. Remove from the pan and repeat with the remaining dumplings. Once everything is fried, place all the dumplings back in the pan in an even layer (do this in two batches if they don’t all fit), sprinkle over the reserved asparagus tips and pour over 4tbsp water and quickly cover with the pan lid. Steam for 3 minutes and remove from the pan. Serve with the asparagus tips, chopped chilli and the dipping sauce. WOW Katie these look superb – I think you may have inspired me to give these a go myself (erm by me I mean Steve). They look delicious and they are vegan too, that's fab. Should I freeze them before or after cooking them?Thanks!